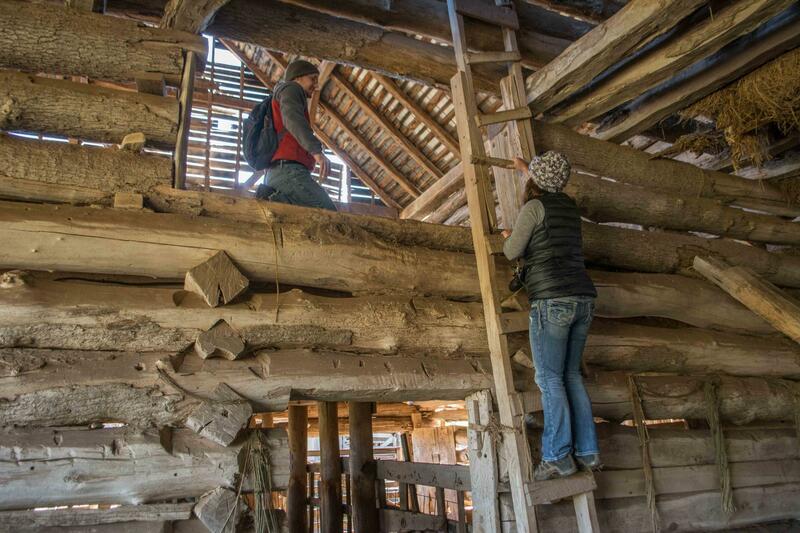 Shawn and Kristen explore the McNeel Barn outside of Hillsboro in Pocahontas County. On a cold November day, Kristen de Graauw and Shawn Cockrell are climbing around an old barn near Hillsboro in Pocahontas County. Kristen is a Ph.D. candidate in Geography at WVU and the project manager for the Historic Timbers Project. Shawn is the lab manager for the Montane Forest Dynamics Laboratory at WVU and the lead technician for the project. The project has two, interrelated goals: to figure out what the pre-settlement forests of West Virginia were like and to date historic structures. Since there aren’t many old trees left, the only way to figure out what the forests of West Virginia used to be like is to take core samples from old logs that settlers used to build barns, cabins, and houses. Today, Kristen and Shawn are exploring a barn owned by the McNeel Family to determine if it’s a candidate for tree-ring dating. The barn is the size of a large two-story house and made of big faded brown logs. They are searching the structure for tree bark so they can determine if there are enough logs to take samples from to accurately date the structure. A log is a good candidate sampling if it still has bark on it because that means they know the outermost layer of the log is intact. Which is important because they use dendrochronology, or tree-ring dating, to determine the age of the structures. Kristen explains how it they use tree rings to date structures. 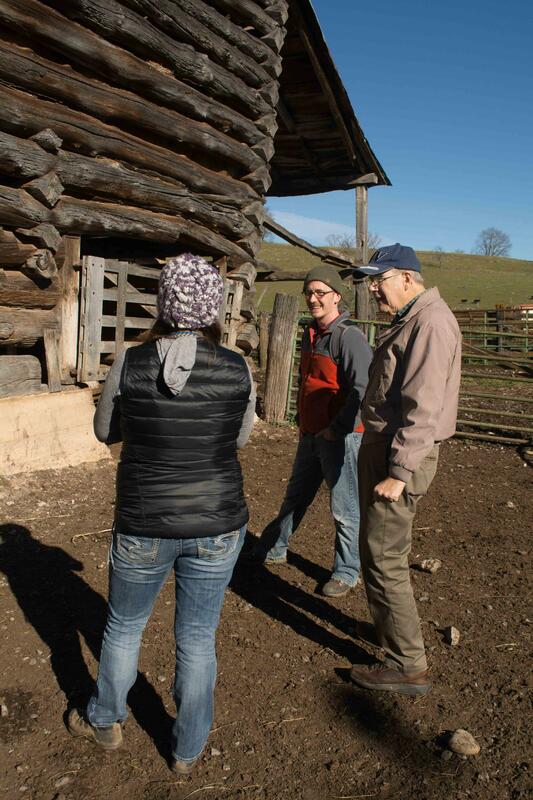 Kristen and Shawn speak with Bill McNeel from the Pocahontas County Historical Society outside of a barn build by his ancestors. Shawn adds that the process is exciting for the researchers and the building owners. After their initial survey, the researchers will return in the summer and use drills to take core samples from the logs. From these samples, they can gather not only an inferred building date of the structure, but also a lot of data about the environment that the tree grew it. Kristen says she can determine a lot from looking at tree rings. “I can look at a tree ring and see the growing season and dormant season of that tree. So it’s not just annual data that we’re look at. We’re looking at seasonal differences,” she said. Which is really important because there aren’t many other ways to gather this kind of data in West Virginia due to heavy logging during the turn of the 20th century. Kristen is working on this project as part of her dissertation. 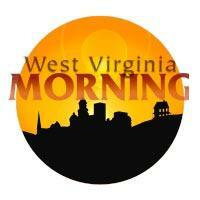 However, she didn’t start with the idea of working with historic structures in West Virginia. Her initial research sent her to Mongolia to investigate ancient forests, but that wasn’t for her. And she couldn’t be happier with her decision to work in West Virginia. 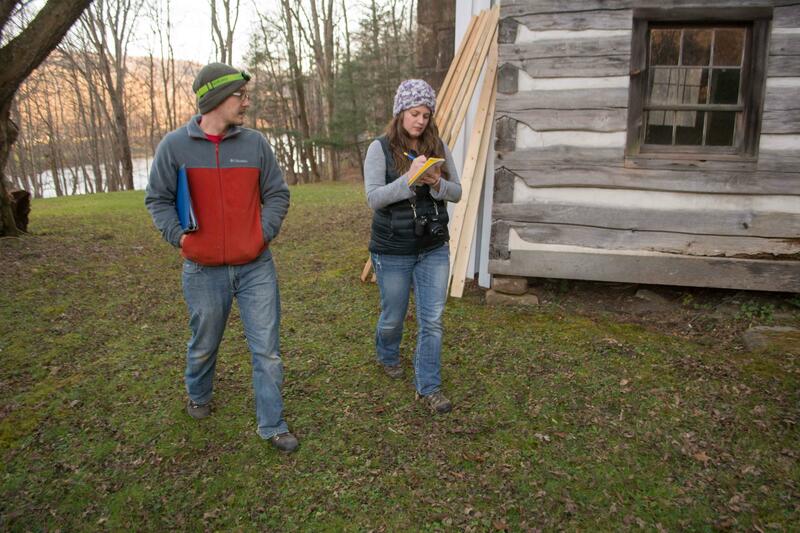 Shawn and Kristen walk around the Kee Cabin on the grounds of the Pocahontas County Historical Society Museum in Marlinton later that afternoon as they work to determine if the property can be tree-ring dated. They have already worked on dating five structures in Greenbrier, Pendleton, Pocahontas and Preston counties with more buildings set to be dated this summer. The inferred building data of the structure is then used by individuals and groups working to list the structures on the National Register of Historic Places or apply for grants to aid in preservation. Kristen says this provides researchers with often-overlooked environmental data held in the logs. Historic Timbers Project will continue its work this summer with support of the West Virginia Humanities Council and the Montane Forest Dynamic Lab at WVU. You may have heard about the scandal involving Volkswagen cheating on emissions standards. 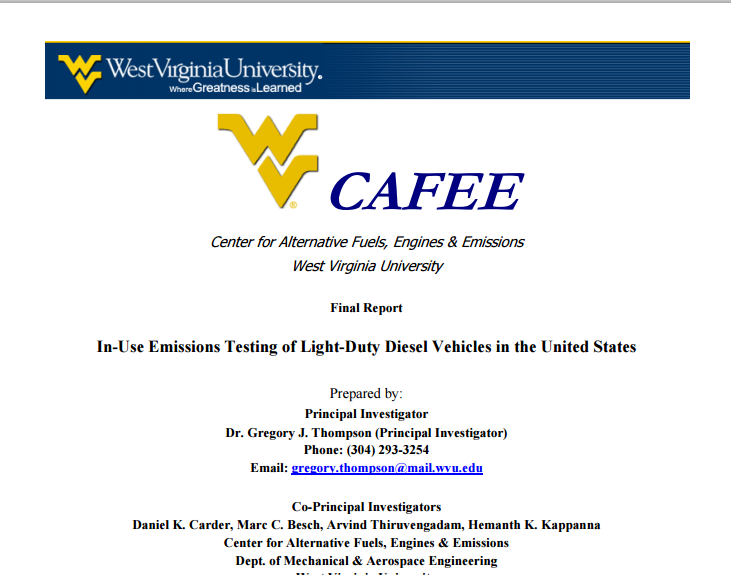 But did you know that WVU researchers helped catch VW in the act? 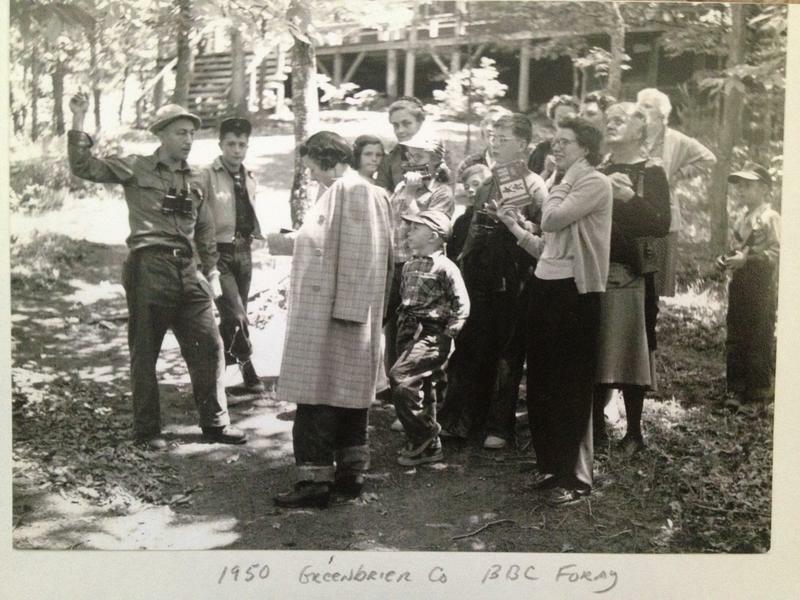 An area of the Monongahela National Forest in West Virginia known as the Birthplace of Rivers is getting some special attention this week. 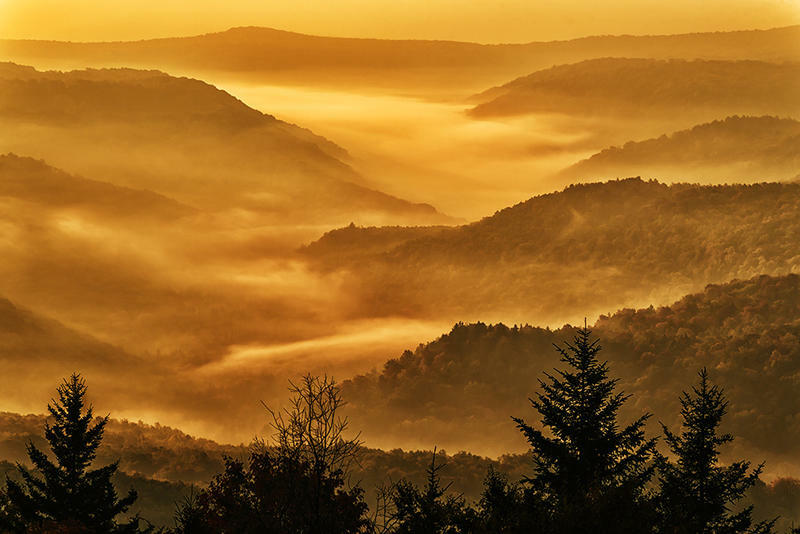 The name Birthplace of Rivers refers to a wilderness area in the eastern part of the state that contains the headwaters for the Cranberry, Cherry, Gauley, Elk, Williams and Greenbrier rivers. A Shepherdstown-based company looks to diversify West Virginia's economy by focusing on solar energy. The Monongahela National Forest gets a new federal designation to help combat insects and disease. Also, a Brooklyn, New York-based theatre company will soon brings a production to Charleston with hopes to open the public's eyes after the Elk River Chemical Spill.